Among the turkic peoples the New Year commenced with this Spring holiday. Therefore, New Year was celebrated on the 22nd of March. And so, we present to you 22 interesting facts about this spring holiday - Nauryz Meiramy. Nauryz is one of the oldest celebrated holidays in the world. 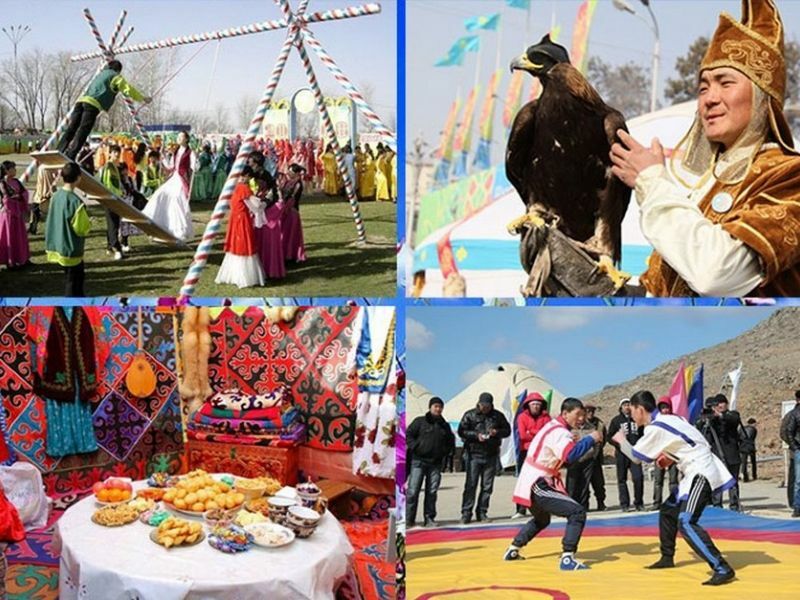 The peoples of Central Asia have been celebrating it for 5 thousand years. From Persian Nauryz translates as “New day”. Before, the elderly called the 22nd of March holiday - “Kyzylbastyn nauryzy” - Nauryz of the redheaded ones (Qizilbash). Kazakh people called Nauryz - “Amal”. The traditional dish of Nauryz is “Nauryz kozhe”. It is prepared out of 7 ingredients. The number 7 symbolized the 7 days of the week and bears a deep meaning. Many popular beliefs are connected with this number. During the Nauryz celebrations the wise elders (aksakals) were offered 7 small bowls in which nauryz kozhe was served. During the Nauryz period one must invite 7 guests to their home and also one must visit 7 homes. In Uzbekistan the traditional dish “Sumalak” is served. It is similar to nauryz kozhe and is also prepared out of 7 ingredients. There are records showing that before the 18th century Nauryz was celebrated in Ancient Greece, Ancient Rome, United Kingdom and Ancient Rus’. These records can be found in the works of ancient and medieval scholars. The history of Nauryz celebrations. The great Abai, in his work “On the origins of some kazakh words” traces the history of Nauryz back to the ancient days as it was popular among the nomadic peoples - “hibigi”, “huzaki”. The persian word “nau”, even after undergoing numerous transformations, has maintained its original meaning and can be found in many languages of the world. In the russian language - nov (month), in German - neue, in Latin - neo. The word “nau” appeared before the indo-european peoples formed as a separate group. Nauryz meiramy is not a religious holiday. It is a holiday of renewal, the passing of the harsh winter and celebration of the New year. During this holiday people greet each other with open arms and exchange kind and good wishes. Girls born on this day were given the names - Nauryz, Nauryzgul, Nauryzzhan. And boys - Nauryzbai, Nauryzbek, Nauryzkhan. In accordance with the UN General Assembly resolution №64 of February 23rd, 2010, on the 21st of march the international holiday is celebrated - “International Day of Nauryz”. In the preamble of the resolution it is stated that Nauryz, the day of the spring equinox, has been celebrated for more than 3000 years in the Balkans, in the basin of the Black sea, in the Caucasus, Central Asia and the Near East. On September 30th, 2009 UNESCO included Nauryz into its list of intangible cultural heritage. Nauryz is a celebration of spring and work, friendship and unity, and the honoring of national traditions. According to the historical works of Abu Raikhan Biruni and Omar Hayam, persian-speaking peoples’ Nauryz celebrations lasted a couple of days. During these days various traditional rituals were performed: big outdoor fires, enkindled by oil, fortune-telling using 7 sprouted grains. The traditional dish “sumalyk” was served in 7 small white tea-bowls. On this day all the old clothes were thrown out as well as old plates and dishes. People gave flowers to each other. On the walls of the houses circles, as symbols of the sun, were drawn. Various competitions were organized and on this day, the young and the elderly, exchanged warm wishes. Terms connected with the Nauryz holiday: the month Nauryz (march in Kazakh), Nauryz-nama, Nauryz-kozhe, Nauryz-toi, Naryz zhyry (song of Nauryz), Nauryz zhumbak (the riddle of Nauryz), Nauryz bata (the farewell message of Nauryz), Nauryz tilek (wishes for Nauryz), Nauryz tol (offspring born in the month of Nauryz), Nauryz esim (name adverb), Nauryz sheshek (snowdrop flower), Nauryzsha (snow fallen in the month of Nauryz), Kydyr (holy elder), Saumalyk (a song sang during Nauryz), Muharram (taboo), Samarkannyn kok tasy (the blue stone of Samarkand). There are many debates about the origins of Nauryz celebrations. Nauryz was celebrated before the birth of Islam. Some scholars connect it with zoroastrianism and paganism, others - with the campaigns of the Persian king. In the Atyrau and Mangystau regions the celebrations of Nauryz commence on March 14th and it is called “Amal”. A traditional element of these celebrations is “Korisu” - on this day people greet each other with handshakes and exchange New Year wishes. During the era of totalitarianism, from 1926 celebrations of Nauryz were forbidden. After a long period of obscurity the celebrations of Nauryz were revived in 1988. Nauryz was officially recognized as a holiday on March 15th, 1991, after the decree of the President of the Kazakh SSR “On the national spring holiday - Nauryz meiramy”. And on April 14th, 2009, by the official decree of the President of the Republic of Kazakhstan, Nursultan Nazarbayev, Nauryz was established as a State holiday and is celebrated on the 21st, 22nd and 23rd of March. Nauryz is celebrated not just in Kazakhstan. It is also celebrated in the countries of the near and far abroad - Azerbaijan, Tajikistan, Uzbekistan, Kyrgyzstan, Turkmenistan, Russia, Afghanistan and Iran. Before Nauryz celebrations commenced with the greeting of the sunrise, which was connected with an ancient ritual - “if you see a spring brook - clear out the path of its source”. On one of the first three days of Nauryz, according to Kazakh beliefs, a special drone-like humming sound can be heard passing through the earth. People say that sheep, which are considered to be animals of heaven, are one of the first ones to feel this humming sound and their shepherds can notice this. On this day nature comes to life, animals and people fill with the air of enthusiasm and the blossoming environment. It is believed that one should not cut their hair or nails on this day, otherwise they risk paralysis. All living things gain special energy only after the passing of “Az” (transition period from winter to spring). There is a popular saying “Do not rejoice until the passing of Az”. Nauryz was widely celebrated before the era of Islam by many different ethnic groups. According to the eastern calendar (shamsi) Nauryz falls on the first day of the month of Hamal (amal). Hamal is the ancient persian name of the zodiacal constellation of Aries. On the day of the equinox, at the beginning of Amal, the constellation of Aries can be seen in the sky. Nauryz, from persian translates as new day - “nau” (new) and “ruz” (day). This is the 3rd month of the calendar (31 days) and marks the beginning of spring. Kazakh people also call it “Az-Nauryz meiramy”. According to the eastern calendar it falls on the same day as the new year celebrated in Iran - Nowruz. Tajik people call it “Snowdrop”, “Gulgardon” or “Gulnavruz”, Tatars - “Nardugan”, people of Khwarezm - “Nausardji”, Buryats - “Sagaan sara”, Armenians “Navasardi”, Chuvash people - “Noris oyakhe”. If on this festive day there is snowfall it is considered to be a good sign. The “Korisu” celebrations last for more than one day - they commence on March 14th and go on until the end of the month. Photos of the renowned photographer Sarsenbek Kyzaibekov were used in the article.